With eight seconds left on the crosswalk timer, a robot knows there isn’t enough time to cross the street. Robots carting takeout from local restaurants are cruising down sidewalks near Logan Circle, an up-scale neighborhood in Washington, D.C. As they buzz along, their cameras and sensors make sure they stop for pedestrians, slow down for bumps, and wait for the “walk” light before crossing a street. Passersby hardly blink. To them, sharing the path with the machines is practically routine. Personal delivery robots are the street-level version of drones that make deliveries to homes. But while drones are regulated by the Federal Aviation Administration, the robots that are scurrying on sidewalks in Washington and other cities aren’t under federal jurisdiction, leaving them open to a wide world of possibly clashing city and state regulations. The nascent regulation of delivery robots includes pilot programs in Washington and three California cities in which robots are operating under specified conditions. As more cities step in to permit and regulate the operation of these robots, a raft of differing rules and requirements could follow. Varying and inconsistent rules could make it difficult for businesses to operate their robots across city lines, lawmakers and attorneys told Bloomberg BNA. “It’s quite possible there will be a patchwork across the country,” Katie Matison, a shareholder and transportation attorney at Lane Powell in Seattle, said. 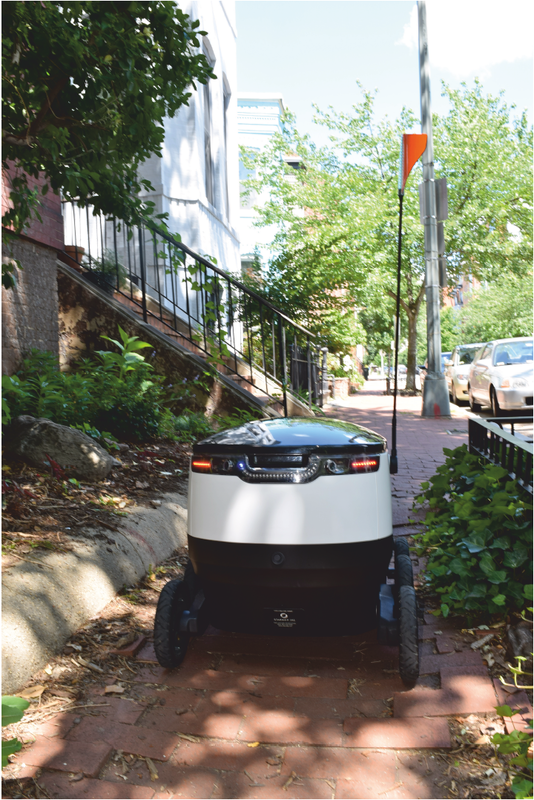 If there is a matter of local public interest, municipalities can prevent delivery robots from operating at certain speeds, in certain areas, or otherwise restrict what they are doing, she said. Cities have a prerogative to regulate new technologies, Nicole DuPuis, principal associate for urban innovation at the National League of Cities in Washington, said. “They’re the only entities close enough to constituents and citizens to say this is working or this isn’t,” she said. But businesses wanting to operate in multiple cities could face hurdles. A company that uses 70-pound delivery robots can operate in cities with an 80-pound weight limit, for instance, but not in cities with a 50-pound limit. A smattering of differing regulations in different jurisdictions would make it hard for businesses to figure out what the laws are in the areas they intend to operate, Jonathon Hauenschild, director of the conservative American Legislative Exchange Council’s Task Force on Communications and Technology, said. A company opening in Virginia will need to find out not only state regulations but also the rules of Falls Church, Richmond, and any other city they might end up in, he said. To be sure, not everyone thinks a raft of differing regulations would be a burden. Varying city laws could present “new opportunities for competition and diversification,” Michael B. Baylous, a shareholder and transportation attorney at Lane Powell in Anchorage, Alaska, said. The robots in Washington are made by Estonia-based Starship Technologies Inc., a leader in the emerging industry. Starship is one of about 10 companies developing these robots, Starship spokesman Henry Harris-Burland told Bloomberg BNA. Starship’s robots can carry items within a 3-mile radius, and customers can expect to receive their takeout food within 30 minutes from the time it is ordered, according to Starship’s website. The city is testing the robots under a pilot program that began in September 2016 and lasts through the end of the year. In the meantime, the city is considering legislation to permanently legalize and regulate delivery robots. The D.C. bill in its current form would require, among other things, that the robots weigh under 50 pounds and not exceed a 10 mile-per-hour speed limit. City Councilmember Mary M. Cheh (D) told Bloomberg BNA that experiences from the pilot program will help the city council determine whether other restrictions are needed, particularly near government buildings or foreign embassies. Cities throughout the U.S. may consider tailoring regulations to meet the needs of their unique spaces and residents. San Francisco is mulling legislation that would ban delivery robots, citing narrow and congested sidewalks as a concern. 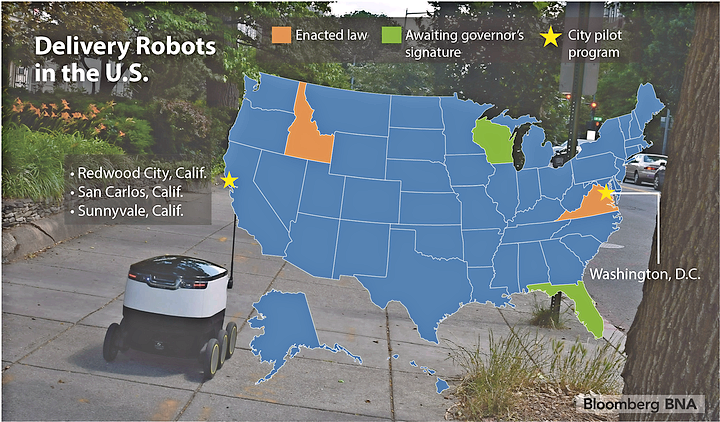 On the state level, Virginia and Idaho already have laws legalizing delivery robots and regulating how they can operate. Wisconsin and Florida are right behind, with similar laws awaiting their governors’ signatures. Wisconsin lawmakers attempted to avoid a jumble of disparate city laws by banning localities from further restricting the operation of robots beyond what the state law stipulates. Wisconsin Governor Scott Walker (R) is expected to sign the measure. Starship teamed up with on-demand delivery services DoorDash and Postmates Inc. to test food delivery by robots under pilot programs in Washington and in Redwood City, San Carlos, and Sunnyvale, Calif. The California city pilot programs have similar conditions for companies wishing to operate delivery robots. San Carlos modeled its conditions on Redwood City’s, San Carlos Public Works Director Jay Walter told Bloomberg BNA. Sunnyvale’s rules are “more detailed” than the other two cities but not inconsistent, according to Sunnyvale Transportation and Traffic Manager Ria Hutabarat Lo. But some jurisdictions may have unique situations that could trigger the need for different or additional regulations. Cities and counties may need to tailor laws to fit their locales, Baylous said. Infrastructure, terrain, and population density are just some of the factors that could affect rules, he said. In San Francisco, adding a robot to an already congested sidewalk creates safety concerns for children and seniors, Erica Maybaum, spokeswoman for city Supervisor Norman Yee (D), told Bloomberg BNA. Yee introduced an ordinance in May that would provide for civil or criminal penalties for the operation of delivery robots. Maybaum also said San Francisco is trying to encourage healthy living, and delivery robots would be “counterintuitive” to that goal. Robots from Marble, another delivery robot startup, are providing deliveries for Yelp Inc.'s Eat24 in San Francisco in a testing phase that goes from April through June, according to Yelp Eat24 head of delivery Shalin Sheth. Maybaum said Marble had applied to initiate a pilot program, but the Department of Public Works didn’t issue a permit. Virginia and Idaho are the first two states to legalize delivery robots. The Virginia law provides that delivery robots must weigh less than 50 pounds, excluding cargo, contain a unique identifying number, be equipped with a braking system and not go faster than 10 miles-per-hour. The Idaho law and the Florida and Wisconsin bills contain similar requirements. They have the same 10 mile-per-hour speed limit but provide that the robots must not exceed 80 pounds, excluding cargo. The four states split on whether cities should be able to further regulate the technology. The Idaho law expressly permits counties and cities to adopt additional regulations for the safe operation of delivery robots, as would the Florida measure. But under the Virginia law, cities may prohibit the use of delivery robots but may not adopt additional regulations. The Wisconsin measure would do the same. Starship has been working with lawmakers to bring its robots to cities and states in the U.S. David Catania, Starship’s U.S. head of public affairs, told Bloomberg BNA that the company is “eager to hear from governments” about how it can best partner with them to develop its robots. Delivery service Postmates has also been engaging with lawmakers and communities. “We want to work with each and every city to address the unique needs of the city while sharing insights from others,” Postmates spokesman Vikrum Aiyer told Bloomberg BNA. The Florida bill is available at http://src.bna.com/pO2.The Idaho measure is available at http://src.bna.com/pPi.The Virginia measure is available at http://src.bna.com/pPb.The Washington D.C. bill is available at http://src.bna.com/pPj.The Wisconsin bill is available at http://src.bna.com/pO5.